Three versions of the character “hu,” a pottery vessel used for holding water or wine. Tea, Wine and Poetry—Qing Literati and Their Drinking Vessels documents the production of Yixing tea ware during the late Ming (1368-1644) and Qing dynasties (1644-1911). The pieces on display reveal the close connections between potters and the men of letters who participated in the making and decoration of these treasured ceramics. Yixing, on the western shore of Lake Tai in southern Jiangsu province, became famous for a type of ceramic known as zi sha紫沙 or “purple sand,” the purple color resulting from the high iron content of the clay (Bartholomew 1977: 13). The teapots featured in this exhibition are renowned for their ability to retain the taste, color and aroma of the tea leaves. Even in hot weather, tea left overnight in an Yixing teapot will stay fresh. These teapots were never washed; the old tea leaves were simply removed and the interior of the pots rinsed in cold water. As a result, the pots that have been in long use often have a rich patina that has been produced by the years of handling (Bartholomew 1977: 13). The names of hundreds of Yixing potters are known beginning with the Wanli period (1573-1619) of the Ming dynasty (1368-1644). This is unusual in the history of Chinese ceramics, since most potters have remained anonymous. “The signing of the wares is an indication that the potters must have been proud of their work and considered themselves as more than mere craftsmen making utilitarian objects.” It also reflects patronage received from the literati class. Men of letters would sometimes select the clay, design the pots, and supply verse written in elegant calligraphy for engraving on the pots themselves (Bartholomew 1977: 16, 17). Broadly speaking, these artistic activities contributed to the image of the man of letters as a civilized person, a cultivated connoisseur of poetry, painting, calligraphy, antique bronzes, jades, inkstones, finely printed books, and well-prepared tea (Clunas 1993: 104-105). the importance of providing students documents or other records beyond materials included in the textbook that will allow students to challenge textbook interpretations, to raise new questions about the event, to investigate the perspectives of those whose voices do not appear in the textbook accounts, or to plumb an issue that the textbook largely or in part bypassed (Standard 4: Historical Research Capabilities). What people drink and how they drink it is also a part of culture. In the United States, for instance, beer is an extremely popular recreational drink with its attendant rituals and practices. In the ancient world, beer’s intoxicating properties were regarded as divine. The importance of beer in the ancient Near East can be seen in the Hymn to Ninkasi, the goddess who introduced the art of brewing to humankind. From the glossary for “What is Culture?” (http://www.emsc.nysed.gov/ciai/socst/grade3/whatisa.html) by Nancy Jervis, part of the New York State Social Studies Standards on the internet (see (http://www.emsc.nysed.gov/ciai/social.html). that the offering of wine, whose fragrance and taste, like the smoke from roasting meat, was pleasing to the Powers would have been an important part of the Shang cult. This conclusion is based on the large numbers of Shang ritual bronzes. . .for heating and pouring wine; the evidence that a Shang industry existed for brewing alcoholic beverages; and the Duke of Zhou’s2 . . . command that the Shang elites (and other lords) should desist, upon pain of death, from wine drinking (Keightley 1999: 258). This ivory goblet inlaid with turquoise (c. 1200 BCE) hints at the importance placed on drinking among the Shang upper classes. The bells and drums are ready. “The Spirits are all drunk” (Shijing 209; Waley 1960: 211). How decorous they are, how reverent! Their manner is utterly changed. . .
Cut capers, lilt and lurch. They do not know what blunders they commit (Shijing 220; Waley 1960: 295-296). Make merry we must while there’s time! Can I let cares overwhelm me? Must I keep waiting for next year? Drink strong wine! Roast the fat ox! May be to dispel dull care (West Gate Ballad; Birrell 1988: 89). gusts flapping open the breast of my robe. more than enough would be no cause for joy. ferment and ladle it myself. official hatpins all but forgotten. my longing for the past deeper than words (Watson 1971: 77). An anthology of poems about or including wine drinking would be enormous and include all the great Chinese poets. Sitting apart on them, we first filled our cups and set them afloat for others to take up and drink. Then we made this rule: when it was someone’s turn to drink, he must throw three bamboo slips about ten inches long upstream; if the slips were neither caught by an eddy, blocked by a boulder nor sunk, he need not drink. But each time one of these things happened, he must drain a cup (Nienhauser 1973: 64). Kong Yiji, a constant source of ridicule at the wine shop he frequents, is a social pariah whose affectation of scholarship and refinement are undercut by his failure to pass the imperial examination and his chronic alcoholism. Lu Xun’s telling the story of this stock character and his cruel fate speaks to the harsh social and cultural changes China underwent at the beginning of the twentieth century. The cherished tradition of literati drinking wine and pursuing a lifestyle “above the dusty world” seemed incompatible with the gravity of China’s social and political plight. 1. More properly called “ale” since it’s brewed, not fermented like grape wine. 2. The Duke of Zhou (Zhou gong) was the brother of the king who led the conquest of Shang and established the Western Zhou dynasty (1045-771 BCE). As regent for an underage King Cheng from 1042-1036 BCE, his policies enabled the new dynasty to survive past its founding generation. He was a hero whose name was invoked down until modern times. 3. Traditionally dated to the early part of the Western Zhou period (1045-771 BCE), the immense prestige of the Classic of Poetry derived from the fact that Confucius was thought to have edited it. It’s a matter of controversy among scholars as to when tea was first used in China. Myth, however, ascribes its discovery to the legendary culture hero Shen Nong (“Divine Cultivator”) who taught humankind how to farm and use the natural world as a source of medicines. Buddhist legend attributes it to Bodhidharma, an Indian prince said to have arrived in China in the early sixth century CE where he became the First Patriarch of Chan Buddhism (Zen in Japanese). Troubled by his inability to stay awake during meditation, Bodhidharma cut off his eyelids. They fell to the ground and sprouted to become the first tea leaves. This story, of course, alludes to tea’s caffeine content. By Tang times (618-907) tea had become a popular drink in north China. A scroll found at the Silk Road’s oasis of Dunhuang even preserves a Discourse between Tea and Wine (Cha jiu lun)5 where the two praise themselves and criticize the other. Buddhism continued in later periods to play a prominent role in the development of habits and objects associated with tea. Monks continued to produce tea at their monasteries; in fact, monastic growth of tea in the Song [960-1279] was of a scale that the state (which at this point claimed a monopoly on the sale of tea) found it necessary to insist that monks grow tea only for monastic use and not for sale (Kieschnick 2003: 275). Monks also valued tea for its medicinal properties and, because it was a mild stimulant, it helped them stay alert during extended periods of meditation. Poets make abundant references to the tranquility of sipping tea, reading Buddhist texts, and conversing with monks. A painting by Qiu Ying (1494-1552), for example, Zhao Mengfu Writing the Heart Sutra in Exchange for Tea,6 depicts one facet of the relationship between literati and Buddhism vis-à-vis tea. the utensils used in the preparation of tea, the way harvested leaves were treated, the location in which tea plants were grown, and the habit of tea drinking itself all in some degree owe a debt to the introduction and spread of Buddhism in China (Kieschnick 2003: 275). Just as Buddhism was the vehicle for the spread of Chinese culture to Korea and Japan beginning in the early centuries of the Common Era and reaching a high point during the Tang dynasty, it also introduced tea to those societies. The spread of tea drinking during Tang is of a piece with the cosmopolitanism of Tang society itself. The Tang capital of Chang’an was the largest city in the world and home to people from all over Eurasia. If you want to satisfy thirst, take water and drink it. If sorrow or anger strike, take wine and drink it. If one would dispel evening drowsiness, take tea and drink it. Each room where he lives is fastidious; each garment which he wears is fastidious; in the food and drink which satisfy him, he is fastidious about both food and wine. He must develop a sense of selectivity and discrimination about it. He must provide the proper implements. He must prepare the right kind of fire. He must select suitable water. He must grind it well. He must brew it to ultimate perfection. He must drink it (Adapted from Carpenter 1974: 116, 118). As a beverage, tea is best suited for inspired and cultivated persons. . .Such a person should practice this [art of tea making] diligently and regularly, not sporadically—only then may he fully appreciate its true flavor. Intoxicated with the fine taste of tea, he will soon realize that it is comparable to the finest wines. At this a gentleman becomes a true tea connoisseur. But, if the drinker is a common fellow, then the fine tea is wasted, which would be like watering an unworthy weed with clear cascade water. This would be a major offense (Chang 2003: 34). In a less rarefied context, teahouses have long been an important gathering place for people from all walks of life. By supporting regional opera and story-telling traditions, they were spaces where native-place identity flourished. Also, some scholars argue that Chinese teahouses exhibit characteristics similar to eighteenth century European coffeehouses, which crucially functioned as public spheres where civil society developed and flourished during the Enlightenment (see Rowe 1993). During the Republican era (1911-1945), however, teahouses fell out of favor. Many saw them as a debilitating reminder of leisurely traditions incompatible with promoting a more “modern” nation-state. By contrast, new venues such as sport stadiums and parks were extolled as public spaces offsetting the image of China as “the sick man of Asia” where citizens could enjoy open-air exercise and commingling (see Shao 1998). The fate of teahouses in contemporary China has fluctuated over the decades, and news reports note how the increased commercialization of public space threatens traditional teahouse culture. 5 This can only be accessed through a search on the website of the International Dunhuang Project (http://idp.bl.uk/). Enter S.406 on the search menu window. 6 Zhao Mengfu (1254-1322) was an important Yuan dynasty (1279-1368) calligrapher and painter. The Heart Sutra was a widely read text expressing central Buddhist concepts in just a few hundred Chinese characters). In addition to playing a crucial role in its domestic economy, for centuries the tea trade was an important part of China’s foreign relations. Tea bricks were used as a form of currency in remote regions of Central Asia. They were also avidly sought by foreign merchants as part of the ancient tribute system structuring relations between the imperial court and other nations. Tea was also an important commodity transported along the “Ancient Tea and Horse Caravan Route,” linking China with its southwestern neighbors, snaking through modern-day Sichuan, Yunnan and into the Qinghai-Tibetan plateau. Chinese horse caravans brought tea, sugar and salt to exchange for horses, cattle, furs and other goods. Tibetans developed a distinctive Tibetan tea culture that for centuries cemented relations between China and Tibet. The Tea and Horse Caravan Route also played a decisive role during WWII. It was used as a supply route for the Republican government seated in Chongqing deep in the heartland of China and cut off from major ports due to Japanese occupation. Today the trade route has come upon hard times as more efficient forms of transportation have largely made the caravan route obsolete. Perhaps the most dramatic role tea has played in China’s international relations was during the late 17th century up to the 20th century, when international trade of narcotics and other goods intensified and created an unprecedented interconnected world economy. Silver from Peru and Mexico began to circulate, as did sugar from the West Indies (grown by slave labor supplied by the Trans-Atlantic Slave trade), coffee from the Horn of Africa, cacao from Mexico, coca from the Andes, tobacco from North America, opium (eventually) from India – and tea from China. economic preeminence in production and transport. China was unrivaled in porcelain ceramics and had few rivals in silk. . .The other important factor was China’s position and function as the final “sink” for the world’s production of silver” (Gunder Frank 1998: 111). dependence on tea. . .had its price—one that the British did not wish to continue paying. As its import bills (all settled in silver) soared, the English sought in vain for a good they could sell to China in equal amounts. The answer they eventually found was opium grown in their Indian colonies, leading to war, dislocation, and a massive addiction problem in China (Pomeranz 2006: 79). This set into motion a series of events that culminated in the disastrous defeat China suffered during the First Opium War (1840-42). By the end of the 19th century, the tables had turned on the British-Chinese trade relations, as tea production had successfully been transplanted to the British colony of Assam. Now silver flowed from China’s treasury as it had to pay an exorbitant indemnity as a result of its defeat in the Opium War. The straining effect on China’s economy was compounded, of course, by the heavy toll opium addiction took on its working populace. China’s ceramic tradition goes back roughly eight thousand years and includes vessels for everyday use, funerary objects, large and small sculpture, and architectural ornament. Thus it’s possible to look at China’s history and culture through a multidisciplinary lens based, at least in part, on this tradition. The web resources listed below will open a few such doors for educators by expanding on the rich cultural context of Tea, Wine and Poetry—Qing Literati and Their Drinking Vessels. A. Guide to Chinese Ceramics from the Minneapolis Institute of Arts. Illustrated with examples from the institute’s collections, this guide begins with the Neolithic and ends in 1600 CE. Each era and each featured work is briefly introduced. Students can zoom in on photos of featured objects for detailed study. B. Twenty-four Ceramic Masterpieces (National Palace Museum, Taiwan). These range from the Neolithic to the nineteenth century. Each photo is zoomable to facilitate detailed appreciation and study. C. Iraq and China—Ceramics, Trade, and Innovation: An interactive website from the Freer Gallery / Smithsonian Institution. D. The collection of Chinese ceramics in the Topkapi Palace Museum, Istanbul. The more than 10,000 Chinese ceramics in the Topkapi Museum attest to centuries of cultural exchange by land and sea. E. Chinese Ceramics from the Asia Pacific Museum. Three lessons—(1) “Tomb Treasures”; (2) “Reaching Distant Lands”; (3) “Fit for the Emperor”—explore ceramics within the context of Chinese history and culture. Six lessons on working with clay plus vocabulary and other resources. G. Ancient fermented beverages (Science Daily). H. This Tang dynasty (618-907) bronze mirror is decorated with a pattern of grapes intertwined with birds, and animals (National Palace Museum, Taiwan). When Chinese poets or writers refer to what translators call “wine” (jiu), it usually means drinks brewed like beer made from rice or other grains. Wine, however, is fermented from grapes. 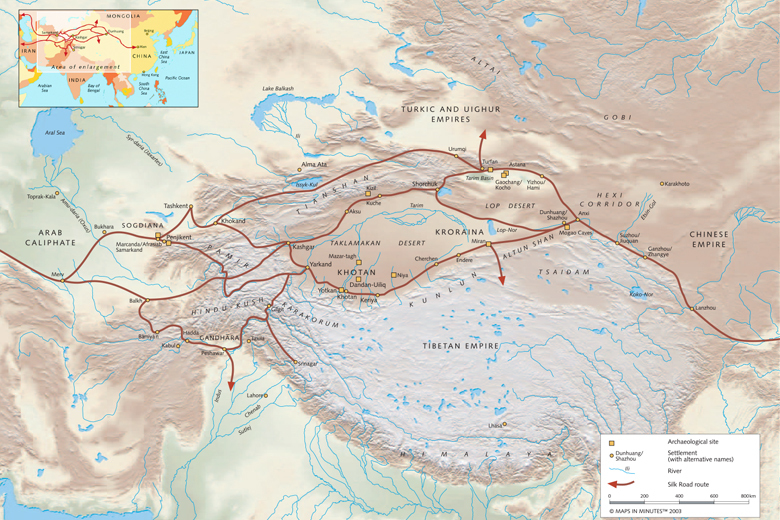 Grapes were first brought to China from Central Asia via the Silk Roads. From the website of the United Kingdom Tea Council. J. An article from the Encyclopedia Americana on the history of tea. A beautiful museum situated among tea plantations outside the city of Hangzhou. Unfortunately, the English part of the website isn’t fully developed. An essay on tea drinking as part of the celebrations in the imperial palace from China.org.cn. M. Tea production in modern China (TeaMuse Monthly Newsletter). An essay on the problems of tea production over the last few decades. These rubbings from a fifth century brick mural depict perhaps the most famous group of literati in all Chinese history. The Seven Sages of the Bamboo Grove sought to escape the dangers of political life in third century China through unconventional thought and behavior. Down through the centuries they were depicted in paintings, ceramics, and other media. They were symbols of nonconformity famous throughout the East Asian world. O. Detail from Orchid Pavilion Gathering, 1621, by Sheng Maoye (active 1594–1640), Ming dynasty, 1368–1644 (University of Michigan Museum of Art). The Orchid Pavilion gathering took place in 353 at the invitation of the famous calligrapher Wang Xizhi. The preface he wrote to the poems written during this gathering is probably the most famous masterpiece of Chinese calligraphy. This is a reproduction of one of the most famous copies of the preface. P. Victory Banquet at the West Garden from the Peabody Essex Museum. This interactive website focuses on a nineteen foot long handscroll depicting “a garden banquet celebrating a pivotal military victory” during the reign of the Qing dynasty’s Qianlong emperor (1711-1799). Q. Tea drinking and the tea ceremony in Japan. Tea has a long history in Japan. The tea ceremony and its setting and utensils are unique aspects of Japanese culture. A visual history from the National maritime Museum. I-hsing Ware. New York: China House Gallery / China Institute in America. Popular Songs and Ballads of Han China. Honolulu: University of Hawaii Press. The Classic of Tea—Origins and Rituals—by Lu Yü. Hopewell, NJ: The Ecco Press. Passion for the Mountains—Seventeenth Century Landscape Painting from the Nanjing Museum. New York: China Institute Gallery. Superfluous Things—Material Culture and Social Status in Early Modern China. Cambridge: Polity Press. ReOrient: Global Economy in the Asian Age. Berkeley: University of California Press. “The Shang: China’s First Historical Dynasty.” In Michael Loewe and Edward L. Shaughnessy (eds. ), The Cambridge History of Ancient China. Cambridge: Cambridge University Press, pp. 232-291. The Impact of Buddhism on Chinese Material Culture.Princeton: Princeton University Press. Pomeranz, Kenneth, and Steven Topic 2006. The World That Trade Created: Society, Culture, and the World Economy, 1400 to the Present. Armonk, NY: M.E. Sharpe. “The Problem of ‘Civil Society’ in Late Imperial China.”Modern China , 19. 2 (April 1993): 139-157. “Tempest over Teapots: the Vilification of Teahouse Culture in Early Republican China.” Journal of Asian Studies 57.4 (November 1998): 1009-1041. The Book of Songs. New York: Grove Press, Inc.
Chinese Lyricism. New York: Columbia University Press.